This morning, we took our time and enjoyed the beautiful weather and the olive grove and the sunshine around the flat. It was a really wonderful way to relax a bit on our vacation. We drove to Pienza, a town built by Pope Pius II, who wanted to renovate his childhood home into the perfect Renaissance town. It is an interesting look, with lots of cues from Florence. He and his architect both died in 1564, and the full plan was not executed, but they did build the papal residence, the church, the government building and one other to complete the main piazza. We parked in one of the lots around the town, and knew we wanted to find a pizza for lunch. This started day four in Italy, and the only pizza we had had this whole trip was back in France! As we walked up the hill from the lot, there was a restaurant on our left, and we stepped inside. We were on the very tail-end of lunch; we were the last folks seated. We ordered two bruschetta, one with olive tapenade and pecorino and the other pomodoro for starters, and Dianne had a prosciutto and cheese pizza, and I had the atomica, with prosciutto, pancetta, piccante salami, and cheese. It was good and filling; neither of us finished our pizza. We almost did not get pizza because they were just getting ready to shut down the pizza oven, but the owner and our server checked before accepting the pizza order, and good for us, it was still ready. Up the hill we went to the Piazza Pius II. We bought tickets for the 'guided tour' of the papal palazzo. It started at 1430, so we spent a few minutes in the sculpted garden waiting for the start. The garden really is a beautiful space, with a view over the Valle d'Orca. We met up with the guide at the meeting spot, and walked up the stairs. The tour includes views into the dining room, the parlor [I can't remember the proper name], the papal bedroom, the weapons room, and the great hall. It is an impressive space, but the guided part of the tour really just means a person to open each room and babysit to make sure no one touches anything. They did provide audio guides in one's preferred language. We walked about the town just a bit, then drove over to Montepulciano. Like almost everywhere we went in Tuscany, the drive took about an hour. It was right at 1700, so we made the decision that walking all the way to the top of the hill only to find everything closed would be a bit of a letdown, so we rode around the town, then started back to the flat. Because of the lateness of the day and the filling nature of our lunch, we decided to eat some bread, cheese, salami, and prosciutto at the flat, left from our trek to Conad yesterday. It was the best sandwich I have ever eaten, including the previous best from the bar on our way to the abbey ruins just a couple of days previous. We wrote some in our journal, looked back over pictures, and tried a FaceTime with E&M without success. Donatella had said she would be to us between 0850-0855, and sure enough, at 0853, I saw 'Sandy', her black tour van turn down the parking lot. She saw us and waved really big. It was impressive that she recognized us a year later and no telling how many other passengers through her tours. This tour was full, with eight folks on the tour: four Australians and four Americans. The other American couple [Irina[?] and Joseph] was from San Francisco and the Australians [Rebecca, Nikki, Elizabeth, and Tristan] were all from Brisbane, though Rebecca and Elizabeth currently live in London. We drove toward Montalcino, and, you guessed it, it took about an hour. Our first stop was at a smallish winery called Santa Guilia. The couple that run it are an Italian husband/Japanese wife with two small boys, a three year old and a one month old. The husband took us for a visit to the cellars, talked about his farm. He produces about 21k bottles annually. We left the cellar and entered the tasting room, which was also the dining room and family room of their home. Kai [spelling? The wife] had prepared a really nice antipasti platter for us, and we were able to taste their 2015 Rosso di Montalcino and the 2012 Brunello di Montalicino along with their 2016 [not dated on the label] olive oil and a Brunello di Montalcino grappa. Everything we tasted was really nice; I especially liked the 2012 Brunello, but he was unable to sell it. There are some pretty strict rules about Brunello [vines must be at least five years old, the wine must age five years before release with at least three in oak, and it has to be bottled at least four months before it can be sold]. It was the last of these that prevented sales. We took a bottle of the 2015 Rosso; it was good, just not quite the level of the 2012. I think the 2015 and 2016 Brunello's will be really good wines based on what we were told at all four wineries plus what I had read in the wine magazines have all said similar things. Those will be wines to look for when they are released. Unusually for Brunello, Guilia sells almost all of their production locally, with 70% sold DTC and the other 30% sold to restaurants and retailers in Italy. From there, we traveled to La Resina [literally, the plain]. Marco and Elira are the husband and wife behind this operation. Elira greeted us, and we saw Marco working in the tractor while she talked to us. 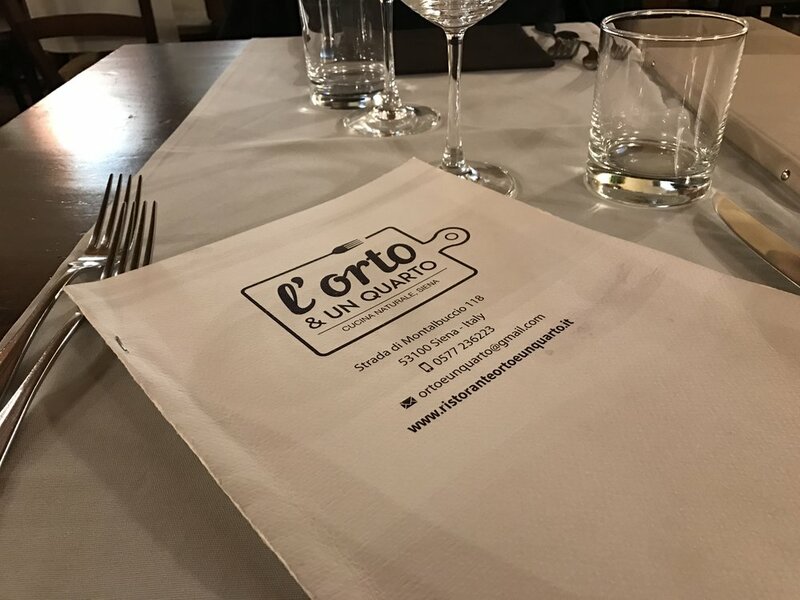 Here again, she had prepared a really nice antipasti platter, and we tasted the 2011 Brunello and the 2014 Rosso plus their olive oil and a barrel-aged grappa. I really liked this place, too, and Elira was very warm. They are a bit larger, producing 40k bottles annually. Next up, we visited another still slightly larger vineyard, with production between 50-60k bottles. Tia, the sister, greeted us, and took us through their olive oil production area. It was pretty cool to see, and she said they could go from olive to oil in about 1.5 hours. She said they pretty much finish grape harvest just in time to start the olive harvest, and it can last through November. I said, "I bet you are glad to see Christmas." And she said, "Yes, then we can sleep!" We walked out onto the patio, and it overlooks a beautiful Tuscan scene. Their place is on top of a hill, overlooking a now-defunct monastery. With the exception of the monastery property, they own everything you can see. We tried two different dry wines, a Rosso and a Brunello, plus olive oil, a Vin Santo, and some grappa. They, too, had prepared a really nice antipasti platter plus some raw fava beans, roasted red pepper, and boiled pearl onions. The Brunello is really best with food, so while all of the snacks are good for us, they also make the wine show better. Dianne and I bought a bottle of the 2012 Brunello, the Vin Santo, and the olive oil, and Tia shipped it to us. We spent almost as much on shipping as we spent on the products. From here, we went to lunch. Donatella's friend, Alberto, and his wife prepared lunch for us. They formerly owned a restaurant and small hotel, but have since sold it. They moved the kitchen to this place where they host small groups like Donatella's wine tour groups. The food was fantastic, with fresh made pasta bolognese for the primi piatta and a veal dish for secondi with a tiramisu-like dessert. 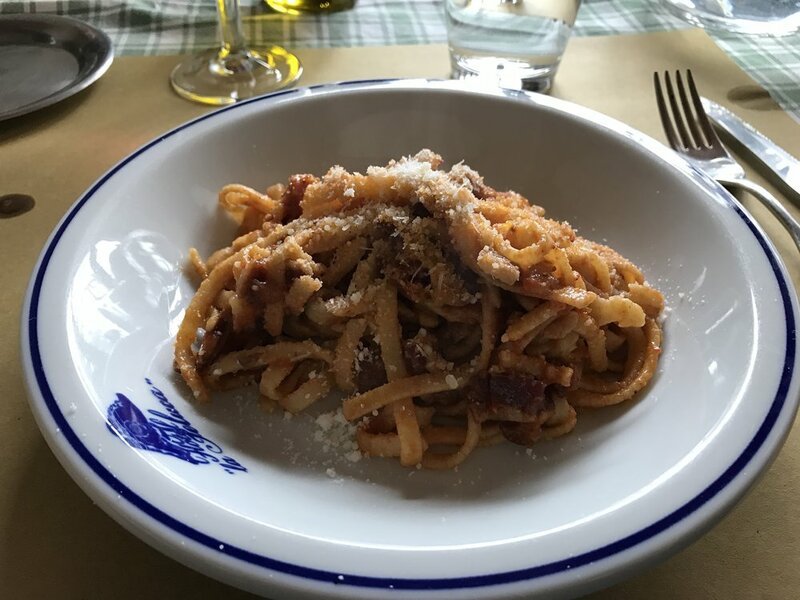 It was good, though a little less intimate than our meal in Chianti Classico in 2016 with Paola. Last stop on the tour was another fantastic Brunello producer who happens to be a British ex-pat. She took us into the vineyard, the first to do that and we skipped the cellar, where she told us about their farming. They farm biodynamically, and she readily acknowledged some of the more woo-woo aspects of that approach, but they like the less-impactful way of farming. We walked down to her tasting room, where she offered us bread, olive oil, and a taste of a 2014 Rosso and the 2011 Brunello. Like everywhere else, both were fine wines, worthy of consideration. At this point it was nearing 1700, so we loaded back in the van and Donatella took us back to Siena. She dropped the Australians off first, in the heart of Siena, then the California couple at their flat. The streets in the old city are very narrow, but she navigated through them in her fairly large van like a native, which she is. She returned us to our car, and after settling up with Donatella for another wonderful experience, she gave us a big hug and told us she hoped to see us again soon. We promised she would, the next time we can afford a trip to Italy. Dianne asked her for the best place to park for a short visit into Siena, and she told us to park in the Santa Catolina lot, almost a straight shot from the shopping center back toward Siena. We headed that direction and found it very easily, thanks to the directions from Donatella and the signage pointing the way. Italian signage can sometimes be a little sparse, but not in this case. They even have great signage pointing the way to escalators to get you most of the way up the hill. Holy cow, that was so much easier than the walk we took last year! Siena is also a hill town, and the hills are steep. We made our way to the duomo, something we did not do last year. I was a little reluctant; it was nearly 1800, closing time at the duomo, but we went ahead and paid the E6 entry. It was worth it. The Siena duomo may be my favorite of the Tuscan churches. It is bright and beautiful with lots of impressive Renaissance art. There is even a library of pieces from Popes Pius II and Pius III, brought from Pienza. The artwork in that space is brilliantly colored. Closing time at the duomo, and we made our way to Il Campo, likely the most famous visual in all of Tuscany, except maybe Campo dei Miracoli in Pisa. Last year, we only saw it on a market evening, but this day, it was fairly sparsely populated, likely a product of the lateness of the afternoon. We walked down to the bottom, and into the courtyard of the public building, but they were not admitting any additional visitors. Back up the hill, back to the escalators and back to the car, we started toward Terra Rossa. As we pulled out of the Santa Catolina parking deck, Dianne said, "Let's go to l'Orto for a drink and dessert." So off we went. We actually ate a plate of the linguini, then had dessert, Prosecco, and finished it all off with an espresso. We got to say good bye to Arianna, and we enjoyed our last evening in Tuscany in this fashion.